Discussion in 'Server Announcements' started by Harry, Oct 13, 2018. I can now confirm that the revamp will be releasing next Saturday, 20th October at 3PM EDT / 12PM PDT / 8PM BST. I have included full changelogs for all of the servers below and have also highlighted some of the key changes we have made to the servers. Placing enchantment books into the Tinkerer will now give you enchantment dust of the same tier. For example, if you place an uncommon enchantment book into the tinkerer, you will receive uncommon enchantment dust. The enchantment dust will be assigned a maximum value of 0-9% based on the success rate of the enchantment book tinkered. You can right click enchantment dust to have a chance to uncover either Success Dust or Destroy Dust of the same tier. Alternatively, you may be given “Mystery Dust”, which is currently useless besides being able to be used to craft TNT. If you successfully find Success Dust or Destroy Dust, it will be given a value between the minimum and maximum value of the enchantment dust uncovered. Success Dust can be used to increase the success rate of an enchantment book by the value of the dust. Similarly, Destroy Dust can be used to reduce the destroy rate of an enchantment book by the value of the dust. You can drag and drop the dust onto enchantment books in your inventory to apply it to the books, much like how you apply enchantment books to items. The Blacksmith is a new NPC which will be joining the Enchanter and Tinkerer. It will give you the ability to merge 2x enchantment books of the same level and type to receive 1x enchantment book of a higher level for a cost of XP. Likewise, it will also allow you to merge 2x enchantment dusts of the same tier to receive 1x enchantment dust of a higher tier for a cost of XP. You can access the blacksmith with the /blacksmith command. We have added two new types of scrolls to the server, Transmog Scrolls and Randomization Scrolls. Transmog Scrolls are a new type of a scroll which organize enchantments by rarity on an item and add the lore amount to the item. Randomization Scrolls are a new type of book scroll which can be applied to any enchantment book to reroll the success and destroy rates of the book. The economies on both servers have been reworked to focus more around spawners following feedback from the polls on our Discord server. All crates are now virtual and no longer require a physical key item to open. Instead, you can now open crates from anywhere using the /crates command. This provides the added benefit of making it impossible to duplicate keys. Additionally, we have reverted the crate rewards to tweaked versions of the old crate rewards which give you more items and better suit the new economies. Scratch Cards have been added to both Factions and Skyblock. They allow you to have a chance at winning high tier rewards for a fraction of their individual cost on the store. In order to win, you must find 3 rewards in the yellow section that are the same as one reward in the green section. You can also find multipliers that allow you to win up to 5x of one reward. You can purchase scratch cards in bundles of 5 or 10 on the server store at https://buy.mythcraftpvp.com/. The old lottery system has been replaced with a new version specifically designed for our servers. It is split into 3 pools, Low Roller, Mid Roller and High Roller. Each pool has a different ticket cost and will allow you to win different amounts of money. The lottery is drawn once every hour. You can now sync your in-game accounts with our Discord server using the command /syncaccount. This will give you your ranks on the Discord server. We have added Pets, Disguises and Emotes back to the network. If you previously had access to a pet on Skyblock you will now have access to it globally. We will be running with the same FTOP rewards as were originally planned for Map 1. The top 3 factions will be sent the following rewards weekly every Saturday, starting the first Saturday after the grace period is over. An announcement will be posted in Discord earlier in the day before the FTOP is calculated informing you which time you must have your spawners placed by. The faction leader must use the command /setpaypal in order to set a PayPal email address for us to send the money to to prevent the payouts from being delayed. We will be announcing the weekly FTOP winners in the Discord #announcements channel every week after the payouts have been sent. TNT Paper will now collect TNT from all nearby dispensers in a radius when left clicking in the air. It has also been hooked into /tntfill, so anyone who has access to tntfill can use the command with a TNT Paper in their hand to have the command fill from the TNT Paper. This allows you better control of the TNT Paper filling, allowing you to specify a radius and TNT limit. The /f warp command will now open a gui listing all set warps for your faction. You can click on the icons to teleport to the specific warp. It will also allow you to enter a password for a password protected warp via the gui. Fixed typing /tntfill while holding tntpaper, it will clear the amount of tnt from fx. (no.) to "nanx"
We have made the decision to change the end of map Buycraft rewards for the top Islands on Skyblock to weekly rewards after running a poll on the Discord server. The top 3 islands will be given the following rewards weekly every Saturday, starting the second Saturday of the map. An announcement will be posted in Discord earlier in the day before the ISTOP is calculated informing you which time the top islands will be calculated. We will be announcing the weekly ISTOP winners in the Discord #announcements channel every week after the rewards have been sent. We have updated the backend server version from 1.8 to 1.12 on Skyblock. This means that if you are on a 1.12 client, you will be able to use all 1.12 blocks and features. The server is still joinable on 1.7-1.13 and combat is still using 1.8 mechanics. Spawners will now stack on Skyblock when placing a spawner against another spawner. The size of the spawner stack will be shown in a hologram above the spawner. The server now features a separate pvp arena located away from spawn which you can access with /warp pvp. Updated the server backend to 1.12. You will now be able to use 1.12 blocks and features while on 1.12. The server can still be joined using versions 1.7-1.13. I would also like to add that we will be running a limited time 90% SALE for the duration of the revamp weekend, which will allow you to purchase ranks for the cheapest prices they have ever been available at on the network. 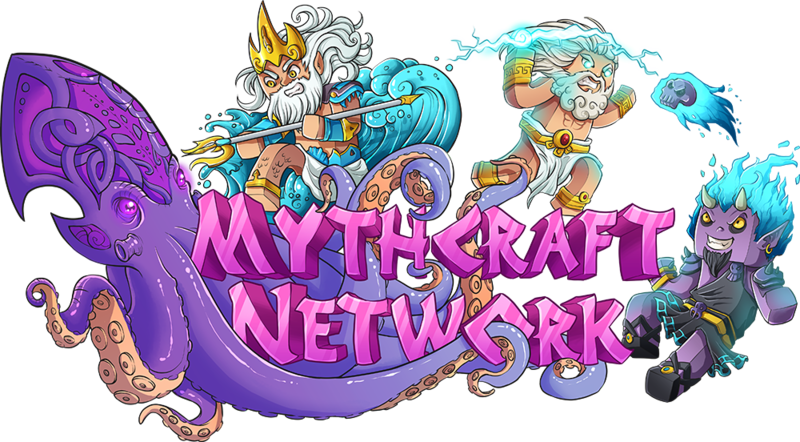 You can find the store at https://buy.mythcraftpvp.com/. Finally, I want to thank you all for sticking with us these past two months while we’ve been preparing the revamp. Future network updates going forward will now be much more frequent. Thanks everyone, I hope to see you all on Saturday! The first 20 replies to this thread will receive a $10 store voucher. so excited for this new revamp!! w0w never played it will be a great start! going to play it with my friends cant wait and a great start with the voucher tho !